Do They Proselytize? No, it’s forbidden. Dogmatic? No, one is usually born Jewish. Mendelssohn: Judaism is compatible with German Enlightenment values AND respects Christianity as a co-religion. 1940s: Aryan Race Theory mostly collapses. Many use the new social category of “ethnicity” to describe Jews. III. Who is a Jew? Jewish by birth: Orthodoxy upholds maternal Jewishness. Progressives uphold Jewishness through either parent. To describe Judaism within the framework of the Old Testament is as misleading as constructing a picture of American life in terms of the Constitution, which is, to be sure, the basic law of the land but far from coextensive with our present legal and social system. to protect an ugly bride’s feelings on her wedding day, Rabbi Shammai said no (cf. Exodus 20:16). But Rabbi Hillel said yes — every bride is beautiful on her wedding day. Hillel won. Midrashim are still being written! If Torah scholars are debating a point of Jewish law, what are your qualifications to intervene? Edict of Thessalonica (380): all Roman citizens must profess Christianity. Jews are outlaws. The Crusades (1095-1291): Jews stripped of the right to live in the Holy Land. Massacred by roving knights. Expulsions: Jews are expelled from England (1290), France (1394), Austria (1421), etc. Most European Jews have nowhere to return. Many seek a new life with fellow Jews in the Land of Israel. 1917: The British write the “Balfour Declaration.” The empire promises the Jews a “national home” in British Palestine. 1939: Britain publishes the “White Paper” limiting Jewish immigration. Jewish insurgents fight British rule. 1947: UN votes to recognize two modern states: Israel & Palestine. Jerusalem will remain a special UN territory. The Jews agree to the UN plan. The Arabs reject the plan, believing they’ll easily overthrow the Israelis. will have it. We shall live at last as free men on our own soil, and die peacefully in our own homes. The Day of Judgment will not come until Muslims fight the Jews, when the Jew will hide behind stones and trees. The stones and trees will say, 'O Muslim, O servant of God, there is a Jew behind me, come and kill him. Hamas is a terrorist organization in the U.S., Europe, and Japan. They are banned in Egypt and Jordan. 1978: Camp David Peace Accords – U.S. President Carter brokers peace deal. Israel gives the Sinai back to Egypt for peace. Anwar Sadat assassinated. 1987-93: First Intifada – Hamas (Gaza) and Fatah (West Bank) uprising stopped. U.S. Pres. Bill Clinton: Oslo Peace Accord signed. Yitzak Rabin is assassinated. Racial Antisemitism: Jews as an inferior race. Also: Jews as not originally from Israel (ie. not “real Jews”). “New” Antisemitism: Jews as having no right to self-determination. Double-standards in Arab-Israeli conflict. Christmas: the December Dilemma – half of all American Jews have Christmas trees! Dress formally. Most men wear ties. Progressive women wear slacks, but legs should always be covered below the knee. Jewish men cover their heads. Orthodox women do too. Progressive sanctuaries will seat mixed genders, with a siddur (prayer book) at each seat. Men and women pray together. Orthodox sanctuaries separate men and women. Also Orthodox women (generally) can’t become rabbis. This is changing. Q. Will contributions to the temple/synagogue be collected? Never! Handling money on Shabbat is forbidden. Instead, synagogue members pay monthly dues on a preset system through the synagogue secretary. Visitors are welcome to send a check to the temple/synagogue on another day, though this is generally not expected. Q. 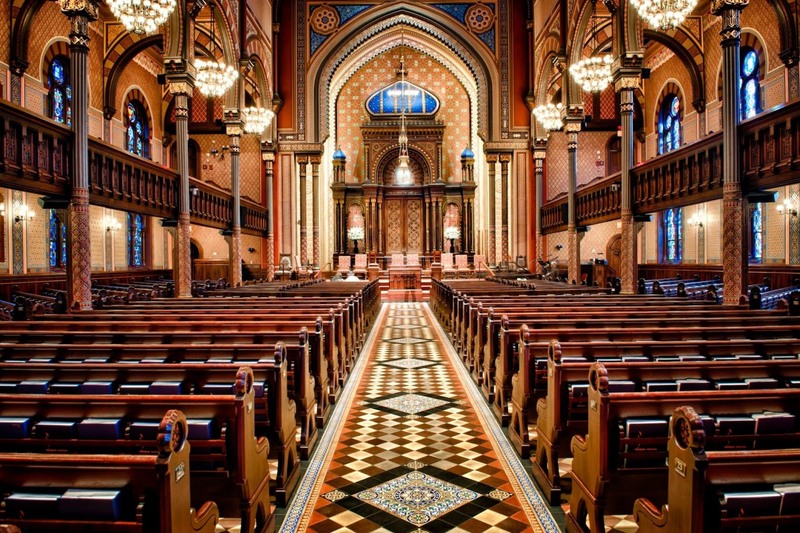 How should I behave in a Jewish temple/synagogue? Also, never bring treif foods into a Jewish house of worship. When in doubt, ask the rabbi beforehand! Guests are always welcome to take part in these activities. Most Jews enjoy meeting guests!